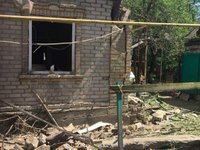 Mine explosions in Donbas have injured 1,858 people, over 400 of them fatally, said Maksym Komisarov, the Ukrainian Defense Ministry's head of ecological security and demining. "According to the information available as of August 1, mines and explosive remnants of war have left 1,858 people injured, this is post-2014. Of them, 482 have died," Komisarov said at a briefing in Kyiv on Thursday. The total figure includes 100 children, 21 of whom have died, he said. Such records were not maintained in 2014, Komisarov said.